Wedding dresses generally cost a fortune. But what if you could make your own, out of whatever was lying around the house? How about a little toilet tissue couture? 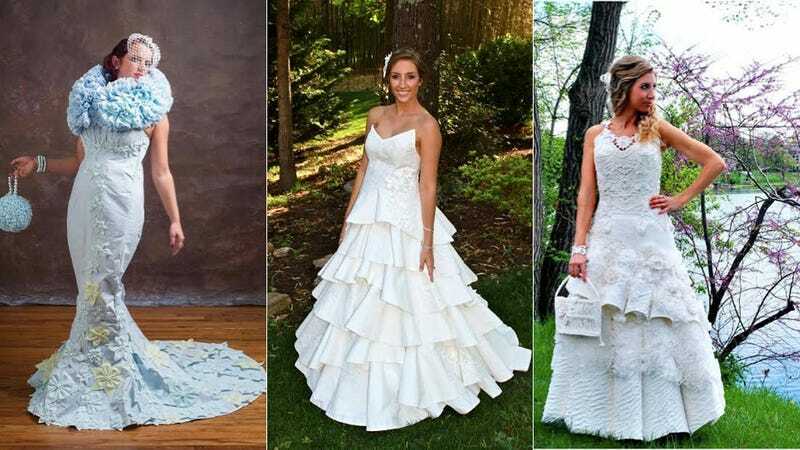 Every year, Cheap-Chic-Weddings.com holds a contest for the best bridal gown constructed entirely of toilet paper. (Maybe they just got tired of Candy Crush?) Crafters were allowed to use glue, tape or needle and thread, but the final product had to be wearable and sturdy enough to be taken on and off. Plus everybody to use Charmin, the contest's sponsor. Project Runway vet Kate Pankoke helped sort through the finalists. Winner Susan Brennan of Michigan (top right) took home $10,000 for her A-line look with crochet-like detail. The skirt was detachable, offering a flapper-like reception look underneath. She dubbed the dress "Romance on a Roll," according to Reuters. "I'm just ecstatic." Let's hope she stores it in a cool, dry place, lest it disintegrate into a giant spitball.